Every artist has a piece of work that niggles them—something that they wish they could redo, given the chance. It’s why Paul McCartney once reproduced Let It Be and why Kate Bush re-recorded Wuthering Heights for her best-of album. 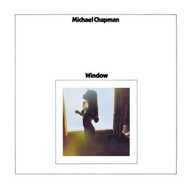 For the prolific Michael Chapman, that album is Window, the missing link in the series of Chapman’s early albums being reissued by Light In The Attic Records. Window sits just after the previously released Fully Qualified Survivor and Rainmaker, right before Wrecked Again. In 1970, signed to the hip Harvest label (home to Kevin Ayers and Syd Barrett, among others), Chapman was still an artist waiting for that first big success, perpetually skint and permanently touring to make ends meet. With that in mind, he aimed to make Window in as little time as possible because being in the studio meant not being on the road. Producer Gus Dudgeon–who’d been working with Elton John–had other ideas and booked Chapman and his band into one of the UK’s most expensive studios, Trident. The singer-songwriter and prodigious guitarist was in transition from his folkier origins to his heavier future and heading for a whole mess of trouble with the same year’s Wrecked Again. Given the touring bust-ups and tortured recording sessions to come, Michael’s wife Andru Chapman remembers the recording of Window was noted for a “lack of hiccups. No one threw their toys out of the pram, unlike Wrecked Again.” Recorded with U.S. guitar player Phil Greenberg, violin player Johnny Van Derek, and pianist Alex Atterson, the album has a blend of electric and acoustic instruments, both traditional and experimental at once, synthetic sounds melding with finger-picked guitars. The trouble came later. Immediately after recording finished, Michael took the band back out on the road with the understanding that as soon as he got back, he’d put the final acoustic guitar tracks down to replace what he’s always said were only guide tracks. Unfortunately, Harvest’s parent label decided the album was finished and pressed it up anyway. And Chapman, as a result, hates it. Indeed, 34 years later he even set out to right the wrong, re-recording parts of the LP and noting it was a strange experience listening to “dead people on the between-track studio chatter” (Dudgeon, engineer Robin Cable, and drummer Richie Dharma have all since passed). As part of Light In The Attic’s revival of Chapman’s early career, however, the album is presented as was originally released, with Michael’s blessing and albeit with two CD-only bonus tracks. Andru notes, "Warts and all, it is an important part of the Michael Chapman: The Early Years story.” Michael has been less diplomatic in talking about the album. "It is a piece of my history for those interested in that, even though I think it sounds like a piece of crap,” he says. We’re loathe to disagree with him, but, well, why don’t you take a listen and decide for yourselves?